Calvin Klein – WHAT IS JAMES WEARING? The dining table is an integral part of the total design experience I create for my clients, and offers a truly fantastic opportunity for creative expression. I’ve been a long-time and quite voracious collector of all things table: dishes, china, glasses, flatware, napkins, silver, decanters etc., but this is not to say I simply hoover up anything I see! There are a few ground rules that I usually observe when setting a table. In keeping with my eclectic design style, I tend not to buy, say, a five piece place setting unless I feel each piece would also stand well on its own. I generally would not mix formal silver flatware with pottery and casual style dishes unless an item in question is a super clean and simple design. The same is true with glasses. When complimenting formal china, I prefer to use fine napkins and table linens. I would use a more ornate or formal silver rather than natural bamboo handled flatware, however something like Tiffany silver or vermeil bamboo flatware would work well with even the most formal china wear. At the risk of stating the obvious, candlelight is essential for evening dinners—there is simply nothing more romantic than candlelight! Try different combinations of plates, napkins, and glasses and then add a wonderful floral arrangement to lend a touch of freshness and poetry to your table. Of course one might consider going light on the more fragrant flowers—after all, the food should play the starring role at at any dinner. As in the decoration of a room, every choice one makes in dressing a table informs each successive decision—conversely, each addition should enhance and compliment one’s previous choice. All of this being said, don’t be afraid to try different combinations to suit your own temperament and aesthetic. Experiment! My dining room is an aubergine lacquer which is completely neutral so I can essentially use any color palette I desire. In the setting I’ve pictured above, I’ve chosen to bring out the colors in my adjoining living room, the duck egg blue, leaf green and turquoise in an eclectic mix of wonderful things. I developed the table starting with Wedgwood Ulander turquoise dinner plates. 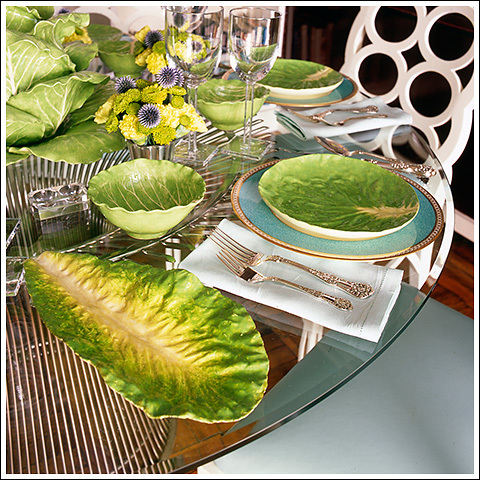 To bring in the leaf green, a monumental lettuce leaf tureen as the center piece, salad plates and bowls by legendary potter Dodie Thayer. To bring in a more modern feel, Calvin Klein “Beekman” crystal glasses. The palest duck egg blue linen hemstitch napkins are from Muriel Grateau Paris. To add a touch of the baroque, Ralph Lauren’s “New Kings” silver flatware. The individual mini bouquets are contained in vintage mercury glass. All of these elements work together to create a sumptuous table for my guests to enjoy and celebrate a magical evening together.